Catharine Littlefield "Caty" Greene Miller (17 February 1755 – 2 September 1814) was the wife of the American Revolutionary War general Nathanael Greene. She was the mother of five, and noted for being a supporter of the inventor Eli Whitney. Catharine Littlefield was born on February 17, 1755, off the coast of Washington County, Rhode Island, on Block Island, where her family had settled in the 1660s. Beginning in 1772, she was courted by Nathanael Greene, a fellow Rhode Islander a dozen or so years her senior. The couple was married in July 1774, but less than a year later Greene was called to war. Catharine Greene had not yet settled into a comfortable life with her husband, as their home in Coventry, Rhode Island had not yet been completely furnished. Greene was energetic and independent, but she looked to her husband to take charge and make the decisions. With his involvement in the war, she assumed the role as head-of-household. 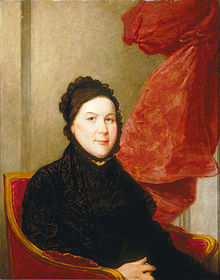 Catharine Greene was not content to remain at home without her husband, so she joined Gen. Greene at his military headquarters whenever possible. Over the course of the war and shortly after, Catharine had five children who lived past infancy. She experienced the conflict of caring for her children while longing to be with her husband. She desperately wanted to have something like a normal family, and when conditions allowed, she brought her young children with her to camp. At other times she left them in the care of family or friends. It was during these separations that Catharine most felt the effects of the war upon her family. When the war finally came to an end and the family was reunited, Greene looked forward to having Nathanael home to share in the responsibility of raising the children and handling business and household affairs. His presence at home "brought a peace of mind unknown to her since the conflict began." She was prepared to let her husband take charge and to settle herself into the life of a respected, well-to-do gentleman's wife. During Nathanael's command in the South, he faced harsh conditions. In order to clothe his soldiers during the winter, he had to personally guarantee thousands of dollars to Charleston merchants. He later discovered that the speculator through whom he had dealt was fraudulent. At the end of the war, the merchants began pressing him for payment on the notes, and judgments came down from South Carolina courts. He was without sufficient funds and heavily in debt. Catharine did not adjust well to the idea of being poor. Their side had won the war, but they had little to show for it. According to Stegeman, "her dream of wealth and leisure, once the war was over, had been shattered; she could no longer count on even the most basic security." Furthermore, Nathanael decided to move the family, in 1785, to a plantation on the Savannah River called Mulberry Grove, in Chatham County, Georgia, granted to him by the Georgia General Assembly in gratitude for his services during the war. Here, he hoped to make a living by cultivating rice, paying off their debts by selling their other lands when the markets proved favorable. This was particularly hard on his wife, who had lived her whole life in the north; she had to leave many friends and what was left of her family on Block Island. She soon began to realize how heavily these burdens weighed on Nathanael. Catharine now saw before her a "tired, haggard ex-soldier who had given himself to a belief, had signed away his future life, in fact, for that cause." Catharine resolved to do everything in her power to help him. She settled into the arduous domesticity that plantation life required, determined to make Mulberry Grove a success. However, her plan was interrupted when Nathanael died suddenly on June 19, 1786 of sunstroke. After his death, Greene met the pressures of rearing her children and handling Nathanael's devastated finances. With the help of the new plantation manager, Phineas Miller (who had been her children's tutor), Mulberry Grove was thriving by 1788. I can tell you my Dear friend that I am in good health and spirits and feel as saucy as you please - not only because I am independent, but because I have gained a complete triumph over some of my friends who did not wish me success - and others who doubted my judgement in managing the business and constantly tormented me to death to give up my obstinancy as it was called - they are now as mute as mice - Not a word dare they utter... O how sweet is revenge! That same year, Catharine met a young man named Eli Whitney, who tutored her neighbor's children. With her encouragement he took up residence at Mulberry Grove to pursue his inventions. Within a year he had produced a model for the cotton gin. In an 1883 article in The North American Review titled "Woman as Inventor", the early feminist and abolitionist Matilda Joslyn Gage claimed that Mrs. Greene suggested to Whitney the use of a brush-like component, which was instrumental in separating the seeds from the cotton. Gage provided no source for this claim, and to date there has been no independent verification of Catharine Greene's role in the invention of the gin. Catharine Greene married Phineas Miller on June 13, 1796, in Philadelphia's First Presbyterian Church. The President and Martha Washington served as witnesses to the union. Mulberry Grove fell upon hard times by 1798. Catharine and Phineas, in financing the cotton gin firm of Whitney and Miller, had lost a great deal of money in a land scam. Caty was forced to sell the plantation along with many of Mulberry Grove's slaves, moving her family farther south to Cumberland Island, in Camden County, Georgia. There she and Phineas established a new home on land that had been given to Nathanael. The plantation, called Dungeness, thrived, thanks to the 210 people they enslaved to work the plantation. In 1803, Phineas Miller died. Catharine Miller lived at Dungeness plantation until she died in 1814, where she was buried. ^ Williams, Arden (27 July 2004). "Catharine Greene (1755-1814)". New Georgia Encyclopedia. Retrieved 25 March 2015. ^ Griffin, Lynne; Kelly McCann (1992). The Book of Women. Holbrook, MA: Bob Adams, Inc. p. 2. ISBN 1-55850-106-1. ^ Gage, Matilda. "Woman as Inventor." The North American Review, Volume 136, Issue 318, May 1883. ^ Cornelia Greene to Eliza Mackay, datelined Cumberland, May 3, 1800 (Mackay-Stiles Papers, Coll. 470, Southern Historical Collection, University of North Carolina, Wilson Library). Stegeman, Janet A. "Greene, Catharine Littlefield". American National Biography Online, Feb. 2000. Stegeman, John F. and Janet A. Caty: A Biography of Catharine Littlefield Greene, Athens: Brown Thrasher Books, 1985. Williams, Arden. Catharine Greene, The New Georgia Encyclopedia. Roberts, Cokie. Founding Mothers, New York: HarperCollins, 2004. Record of Pennsylvania Marriages Prior to 1810, Vol. 2, Baltimore: Genealogical Publishing Co., 1968. This page was last edited on 31 March 2019, at 15:16 (UTC).